Works to include Marc Bohne, Stephanie Frostad, Kent Lovelace, Lois Silver, George Gorgas, Brian Schweyen and Elizabeth Bass. The studio has released for sale a group of oil sketches on paper. Details about these paintings can be found on the Works on Paper page. Marc is honored to be the 2011 recipient of the Claire Short Ireland Residency, created by the generosity of Artist Trust donors Emer Dooley and Rob Short. You can read the details of the residency in the 5/19/2011 Artist Trust press release. 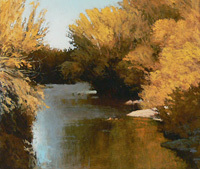 2009, Featured artist in Landscape Painting: Essential Concepts and Techniques for Plein Air and Studio Practice.